When the temperature of a microbial population is lowered beyond a certain level, its growth ceases and can become inactive. The phenomenon is reversed upon heating. 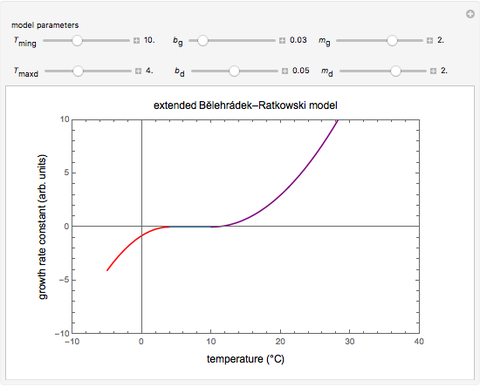 The temperature effect on the growth rate above the minimal temperature needed for growth has been frequently described by Ratkowski's square root model, a simple, useful variant of the Bĕlehrádek model. This Demonstration provides graphical visualization of an extended version of these models in the region where growth ceases and turns into inactivation or vice versa. The extended model has been constructed by mirroring the temperature effect in the two regimes and allowing for an intermediate temperature range where the population size remains practically unchanged. where can, but need not always, be equal to 2 [2–4]. Notice that without the added "If" statement, the original model's equation implies that at the rate constant rises if , or becomes a complex number if is a noninteger. In reality, it can be expected that at temperatures below , growth not only ceases but turns into mortality, causing the population size to decrease. In terms of the model, at , the growth rate changes sign and becomes negative, signifying inactivation. where and , and are the pairs of the decay and growth parameters, respectively, and and mark the region where the population size remains practically unchanged. 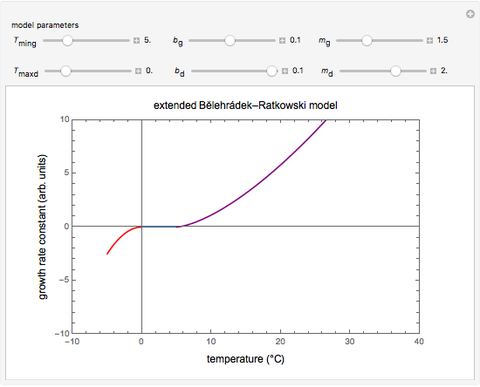 This Demonstration provides graphical visualization of the expanded version of the Bĕlehrádek–Ratkowski model in the transition region from growth to inactivation or vice versa with sliders to set the model parameters , , , , and . 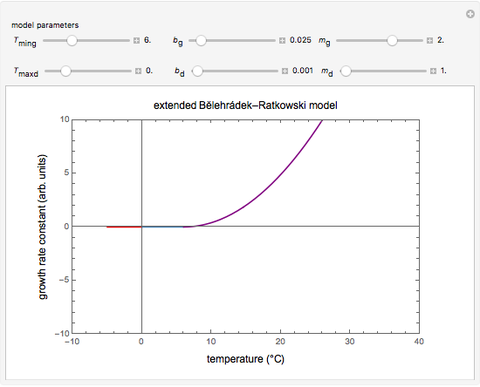 Notice that in Ratkowski's original model is a special case of the expanded model where , and . Where , and , the model renders an inverted image of reminiscent of the shape of a curve following the log-logistic inactivation model. The purpose of this Demonstration is only to illustrate the extended version of the Bĕlehrádek–Ratkowski model, not to match the behavior of any particular micro- or macroorganism . Therefore, not all the parameter combinations allowed by the controls necessarily represent real-life growth/inactivation or inactivation/growth scenarios. 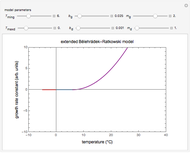 Also, this Demonstration addresses only the growth/inactivation rate constant, ignoring the other kinetic parameters that account for the shape of the entire inactivation/growth curve . D. A. Ratkowski, J. Olley, T. A. McMeekin and A. Ball, "Relationship between Temperature and Growth Rate of Bacterial Cultures," Journal of Bacteriology, 149(1), 1982 pp. 1–5. jb.asm.org/content/149/1/1.full.pdf+html. T. Ross, "Bĕlehrádek-Type Models," Journal of Industrial Microbiology and Biotechnology, 12(3–5), 1993 pp. 180–189. doi:10.1007/BF01584188. J.-F. Briere, P. Pracros, A.-Y. Le Roux and J.-S. Pierre, "A Novel Rate Model of Temperature-Dependent Development for Arthropods," Environmental Entomology, 28(1), 1999 pp. 22–29. doi:10.1093/ee/28.1.22. L. Huang, C.-A. Hwang and J. Phillips, "Evaluating the Effect of Temperature on Microbial Growth Rate—The Ratkowski and a Bĕlehrádek-Type Models," Journal of Food Science, 76(8), 2011 pp. M547–M557. doi:10.1111/j.1750-3841.2011.02345.x. M. Peleg and M. G. Corradini, "Microbial Growth Curves: What the Models Tell Us and What They Cannot," Critical Reviews in Food Science and Nutrition, 51(10), 2011 pp. 917–945. doi:10.1080/10408398.2011.570463. 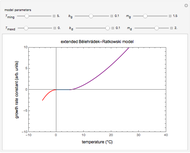 Mark D. Normand and Micha Peleg "Extending the Square Root Growth Rate Model to Lethal Low Temperatures"